I'm pretty sure I bought this because of a few Wu-Tang tracks that are on it. Though I think I realized quickly that the track listings on mixes like this always make it seem more appealing than it usually ends up being. This is a long disc (they should have called it 75 Minutes of Funk), and sifting through the crap I don't care about must have ended up being more trouble than it was worth, because I can't remember the last time I listened to this CD. One thing you have to get past when listening to any "mix tape" are the inevitable intros and sporadic shout-outs by the DJ. Funkmaster Flex's voice really grates on me, so when he gets to yellin' on this thing, I'm always more than ready for him to shut the hell up and let the dudes "freestyle." I'm putting that in quotes because, as usual, while some of the verses were clearly made up on the spot, a lot of 'em obviously weren't. In fact, most of the songs have a second track of back-up vocals. Maybe I just don't understand how these things work. Along those same lines, while it sounds like a cool idea to hear Mack 10 freestyle over Wu-Tang's "MGM," it doesn't really work. Same with the other handful of people that rap over well-known Wu songs. I can see how it would kind of fun to hear it live on the radio, and I think the idea of this is sort of recreate that vibe, but it never really worked for me. Maybe I'm just not a mix tape kind of guy. 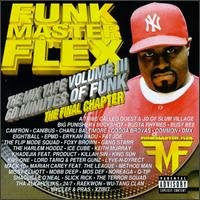 Funkmaster Flex is the most annoying person on Earth. I get that they yell on the song so dudes can't bootleg it but come on. Do you have to scream every 5 seconds? It's all very annoying. Hearing crappy rappers over Wu songs make you appreciate the Wu even more.